Have you ever wondered if there was a handy (and inexpensive) way to store rolls of craft supplies like contact paper and stabilizers? I really struggled with it. I wanted these things at my fingertips but not rolling around or shoved in a box so I headed out to the garage to look in my hardware supplies to create this simple hanging organizer. I'm creating a simplified tutorial here to guide you through but I'm hoping the photos tell the real story. Cut your wood dowels to the length of the longest roll you have. For me, this was the contact paper at 18 inches long. 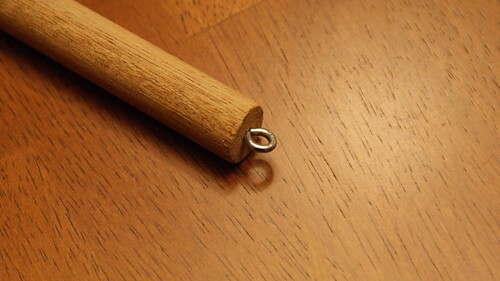 Insert a screw eye into each end of each dowel. This is definitely the most labor intensive part of the whole process. Clip a squeeze clasp on to each screw eye. 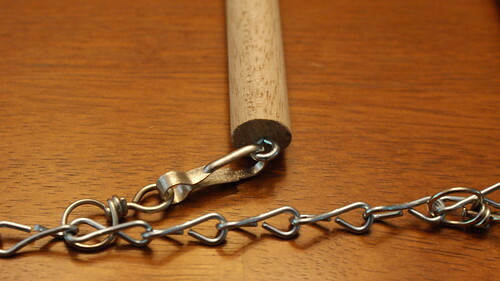 Using pliers, pry open the end link of chain and tighten it back around the loop of your squeeze clasp. 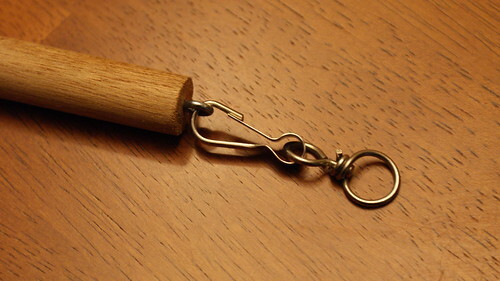 If you don't have a loop, hook the squeeze clasp directly to the top link without prying it open. This will serve as your very top bar. Repeat with the next bar about 6 inches down from there. Only my hope for you is that your craft room has better lighting. I'm in the process of moving things out to the laundry area to free up the craft room to become a nursery. It's a bittersweet transition. I do love coming up with new ways to organize my stuff though. 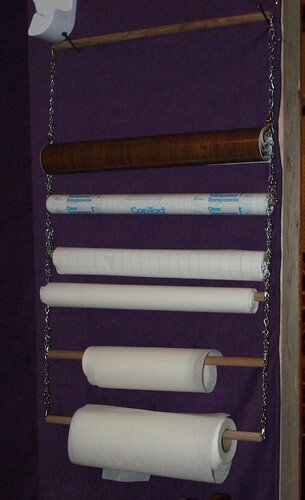 How do you store your rolls of craft and sewing stuff? I tried keeping them in a clean trash can but the edges kept getting bent. This seems to work a lot better and leaves them accessible so I can just pull a length of it off the roll or release the clasp if I need to take the whole roll somewhere to work with it.